Dr. Murray has been working with our family, for three generations, sons, daughter in laws, grand children, cousins and myself. What a rewarding experience to go to his office and above all, we all now have beautiful smiles. The office is very pleasant, happy, always upbeat and the staff is proffesional, friendly, helpful and knowledgeable. For myself at 71 years of age, I was faces with losing my front teeth. I traveled from Florida to Maine each month in order to go to Dr. Murray’s office. My teeth were saved thanks to his ability as am orthodontist and a person to m ake it happen. 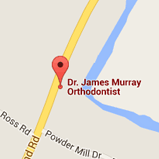 Dr. Murray and his staff are the best, they go the extra mile to make orthodontia a pleasant experience. Dr. Murray was my orthodontist when I was a child so when it came time to chose an orthodontist for my children, the choice was easy. From the moment you walk in the door you are greeted by your name and with a smile. The entire staff makes sure every patient is relaxes and comfortable and Dr. Murray always has interesting trivia to share. Scheduling is easy. Billing is tailored to each individual family and the end result is a beautiful healthy smile! Thank you Dr. Murray! I have never had a more positive experience. The staff in Dr. Murray's office has been more than accommodating-efficient, courteous, and more than pleasant. The financial aspect was painless-before we knew it, the payments were finished. 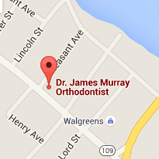 And last, but not least, Dr. Murray has what it takes to be an orthodontist. No matter how busy he was, he would take the time to speak personally to each patient and the parent...and not in a hurried fashion. I have recommended this practice to everyone seeking orthodontic treatment. Thank you! I had always been slightly embarrassed by my overbite, especially around strangers...I thought I was way overdue for corrective braces. My son finally grown, it became my turn to do just that! Dr. Murray has an excellent reputation and in fact, corrected my stepdaughter's teeth. I started this adventure almost two years ago...it's exciting to see the progress and I look forward to the finished smile!